2) It’s a pattern I designed a year ago, therefore my brain already knows what’s going on and I don’t have to spend a lot of thoughtful energy stewing over something new. The fit is the thing that has been making me twitch a bit, though. The yarn I’m using knits up slightly looser than the gauge used in the pattern – 16 sts/4 ins instead of 17 sts/4 ins. That might not seem too different, but over a full garment it does end up giving you an extra inch or three depending on the size, when it comes to width or circumference. I was all confident about this and was happily going to do a modified smaller size (as written) to get the actual size I wanted (as knitted), but my indecision got the better of me after I did the sleeves in that manner and they seemed a touch smaller than what I was going for. (This is a cabled hoodie, and intended for Rhinebeck or at the very least fall-to-winter wear, so I’d like a slightly loose fit than anything else if at all possible. Outer layer here we come). Yesterday I finished up the back piece on the new size decision, and immediately washed it and pinned it out to block. 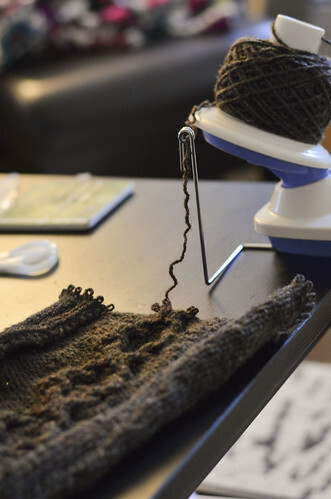 This is an advantage of knitting sweaters in pieces – you really don’t need to wait to the very end to check this, you can go one piece at a time if it gives you peace of mind. And in this case it did. I had nothing to worry about, everything is coming out just as anticipated based on my (washed and blocked) yarn swatch, and if nothing else it will turn out on the looser fit side of things, which is fine with me. I suppose it wouldn’t be a Rhinebeck sweater without a bit of anxiety and overthinking and down-to-the wire deadline knitting, though, so by that score I am completely on schedule. Onwards! To fall, and to cables. Happy fall knitting! Question: If you use your yarn winder to rip out, does that mean you don’t wet the wool to let the kinks relax? I’ve use a Niddy Noddy to frog, then wetted the wool and hung the skein to dry before rewinding it. Do you find this an unnecessary step? In this case I’m less concerned about letting the yarn un-kink between the ripping and re-knitting. It’s a pretty robust yarn, and the wet-blocking process will accomplish much the same effect as washing the yarn would. However another knitter might want to do the yarn washing step in between, so YMMV! I’m happy skipping it in this case. OK, this has sold me on the benefits of starting with the sleeves. Thank you!! So, you’ve got the back done now … did you re-do the sleeves already also? I think you’ll do it. You are the Knit Queen of Determination – procrastination doesn’t stand a chance! ha. 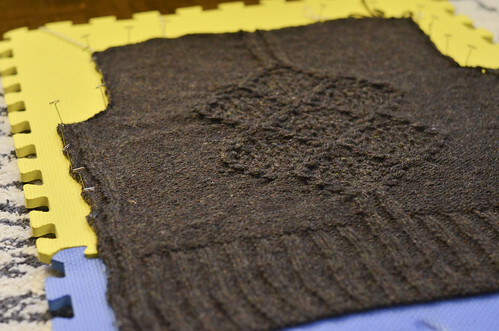 That is going to be a gorgeous sweater — love the color, and the rustic feel/look of the wool. Can’t wait to see the pictures from Rhinebeck! I’m currently working on your Basic Black, in grey, and am just about finished with the back. I think I might follow your lead with blocking that piece when I’m done, as I’m currently considering whether I did in fact get enough yarn, even though I got gauge, got an extra ball for the size, and am considerable shorter than your fitting model in both torso and arm length. Ahhh! Yes! I have done that when ripping out something. Ball winder. Attach the end, TURN! No mess on the floor for the cats to play with. No dust bunnies to pull out as you wind the mess into a ball and NO TANGLES! I have not done a Rhinebeck sweater run in the 4 years I have been going to Rhinebleck. Maybe one day but, I am just not fast enough. You and the Yarn Harlot do this every year it seems. There is always excitement and “did she make it?” But I just don’t have that speed; especially as I am working the festival and will have just gotten finished with Spinzilla the week before. Thats a really nice design on the back of the sweater. Where can i get the pattern. I know it’s your design.do you sell your patterns? I’m sure you’ll get it done in time, even with the ripping!